In the first article I reported how more than 50% of ERP projects are over budget and overdue using a 2103 report from Panorama Consulting. In the second article I presented research data that revealed a typical training curriculum for ERP projects costs 10-20% of the overall project budget, affects 10-20% of the organization and is the most underestimated budget item. Given this, one cannot deny the importance of having a well thought out training and implementation plan for enterprise software projects. Yet many companies and consulting firms ignore the need for training and typically save it as the last activity before go-live or conduct it too early in the project without providing follow up training. Phase 3 of the Training and Implementation Plan gives you an opportunity to showcase some creativity and to highlight, with real data, how users are progressing in the new system. It is also the phase that keeps users engaged in the system leading up to go-live. During this phase I will be introducing the use of one of my favorite (and free) collaboration tools: Google Drive. You will also be presented with the option to use another one of Google’s great services for free: Google Sites. As the name implies, the objective of this phase is to accurately gauge the proficiency of your user base. Not just by seeing if they can follow a job aid to click where told, but to ascertain whether or not users are comprehending how the re-engineered business processes are functioning in the new system. By conducting monthly user proficiency tasks, you will be keeping users engaged in the system and processes while helping them develop the required skills to operate post-launch. Remember, ERP systems are big, clunky, and often unintuitive to the user. It will take some time to get everyone in the organization functioning at the same skill level within the system but by conducting these monthly tasks, it will shorten the time frame. Other benefits of these monthly exercises are that users can practice and learn the system on their own time and it reduces training time that is required during Phase 4. Data will also show if users are struggling in certain areas and allow you to focus your training efforts there so that they are prepared for go-live. In some cases you may also find these exercises give you the opportunity to refine system processes and procedures of your more complex business situations. Participants of the monthly tasks will include the SME’s and all end users broken out by module/section of the system as defined in the user tracking sheet. Supervisors and managers who will not be performing these tasks in the new system are not required to complete these tasks. As with Phases 1 and 2, these exercises will be conducted in a functioning test or development instance of your application. Step 1: Create task. Create tasks that are derived from the business processes that will be conducted in the new system. Examples of this might be to run an inventory valuation report, create an invoice or create a trial balance from certain accounts. It will be important to provide detailed instructions with these tasks and to include necessary job aids and data sheets so that users can complete these with minimal assistance. 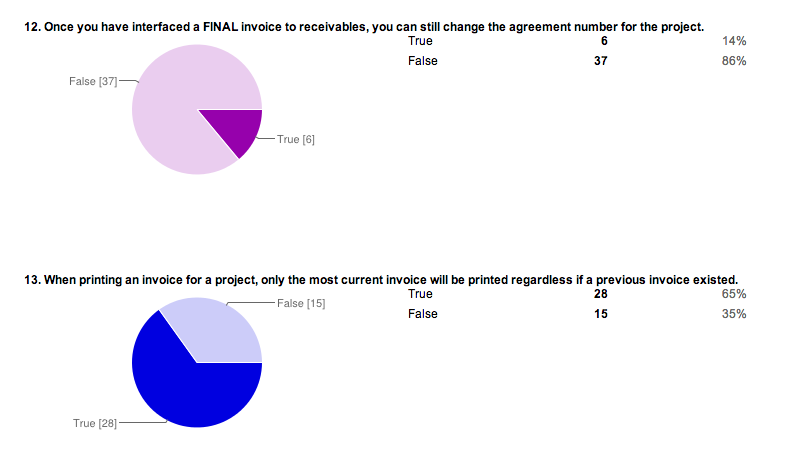 To illustrate, I will expand on the example of creating an invoice. In this exercise, provide users with the background or script of the situation. During one of my implementations, it was a freezing cold winter so I decided to write a scenario where they just returned from a tropical island only to find there was a mountain of work to do in the new system. They had to create a new project, set up the billing tasks, enter activity, and create an invoice. The scenario was fictional, but people could visualize this potentially happening. You can read that cheesy scenario here. These three line items will total to a known amount. On the assessment form, you can create a multiple choice question for the users to choose from or a blank box where they must enter the invoice total. The difficulty level on proficiency tasks can be raised should you choose to do so. For instance, you could have one of the items above be exclusive of tax. Or you can split the invoice in two and then test users on the new amounts. Take this opportunity to be creative with these assignments while also challenging users to raise their level of proficiency in the new system. Step 2: Create online assessment. Now that you have successfully created the proficiency task, we need a method of capturing the results of each task sent to the users. Here is where Google Drive comes in. Within Google Drive there are applications that allow the creation and collaboration of documents, presentations, worksheets, drawings, and forms. 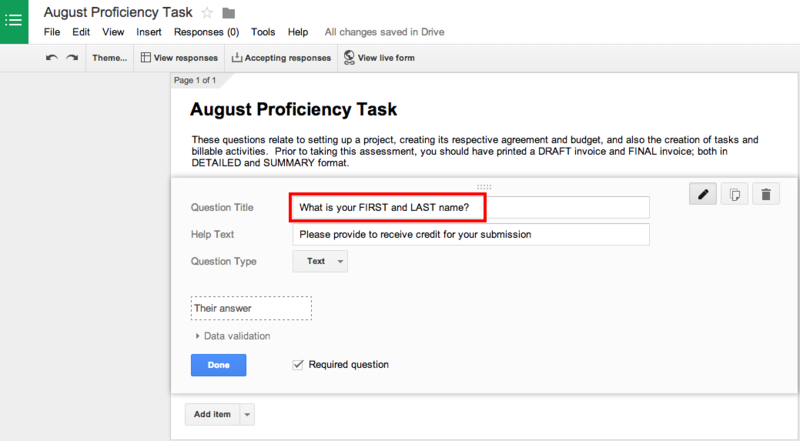 For our monthly proficiency tasks, we will use Google Forms to create the user assessments. 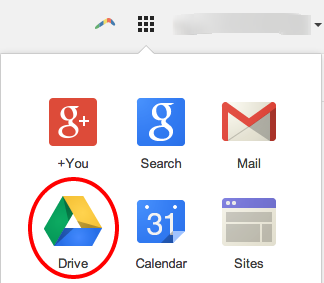 If you have a Gmail account, log in click on the square tiles in the top right corner of the application and choose Drive. Even if you don’t have Gmail, Google Drive is free to anyone with a valid email address. You can sign up here. After you have successfully logged in to Google Drive, create a new form by clicking “Create”, then clicking “Form” as shown below. The application automatically places you in editing mode of the form. Creating and designing these forms is fairly intuitive and there are many types of questions you can create. Click the drop down box next to “Question Type” to see the list. To add a new question, click “Add Item” and select the type of question you want to create. Start by capturing the names of those who are completing the form so that you can calculate the completion rate of the tasks and follow up with those who did not complete it. This lets you know how much time users are spending to complete the task and whether the assigned tasks are too difficult or easy for them. Be courteous of people’s time and don’t create long, complicated tasks that take up 8 hours of their day. 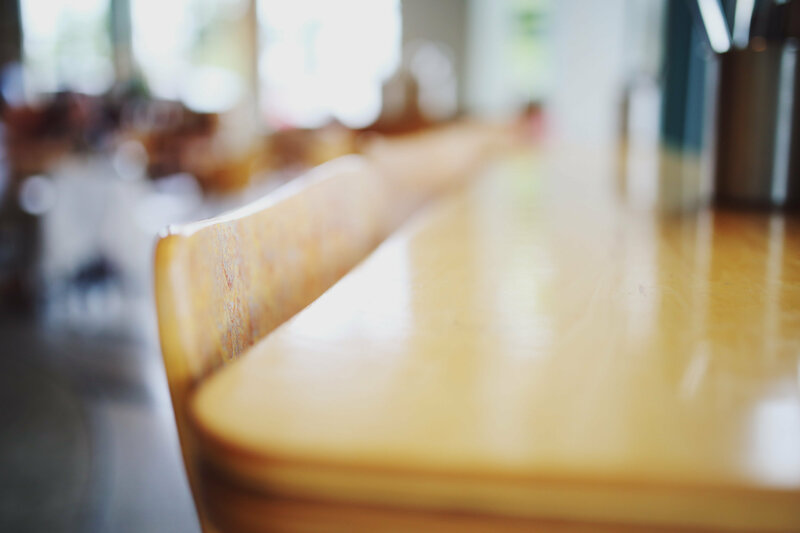 At the same time, look for outliers who may be taking an excessively long time to complete and reach out to these people to see if they need help and guidance from you or someone on the team. If the tasks are to easy for them, kick it up a notch. If it is too difficult, scale it back. Remember, the objective is not to trick users but rather keep them working in the system while at the same time learning from the assigned tasks. If you need some ideas to help get you going, you can view an assessment I created and sent out prior to Oracle launch #2 in 2012 here. Step #3: Validate task with colleague. Just like in Phase 2, it is important to always validate and test that what you are about to send out to the masses will actually work the way you want it to. Email the proficiency task with the instructions, data sheets and link to to the online assessment to another member of the team. Have this person assume the role of the user by completing the task and taking the online assessment. This will ensure the instructions and test questions are well written and will save you from being inundated with questions from the users. To get the link (URL) to the online form, click “View Live Form” when in editing mode of the form, then copy the link in the URL bar of the browser. Step #4: Email task and assessment URL (link) to users. Now that you have successfully validated the proficiency task and online assessment, send it to the specified users to complete along with a due date for completion. The recommended due date is two weeks from when the proficiency task is emailed. Why? As I discovered, humans like to procrastinate and will wait until the last minute to complete an assignment. Anything longer than two weeks will just mean the next month’s task will be mailed soon after. Two weeks is just long enough for people to figure out when they can complete the task and it gives you time to review the data coming in from the assessments before creating the next one. Also be sure to send out reminders as the due date nears. Another thing I recommend is to encourage users to form teams or groups and work on the proficiency tasks together. This creates a camaraderie among the user groups and a sense of “we are in this together.” It also gives the nominated Subject Matter Experts (SME’s) an opportunity to start being a point of contact for users at various sites prior to go-live. Remember, the goal is knowledge transfer to the business. The business “owns” the enterprise software, not those who are on the implementation team. Step #5: Review and report user training statistics. Now that users have completed the online assessments, it is time to review how they fared with the proficiency task. Hats off to Google for this one. As you are capturing user data, Google Forms is quietly aggregating and summarizing the data for you in to nice charts and graphs. Thanks Google, what a time saver! 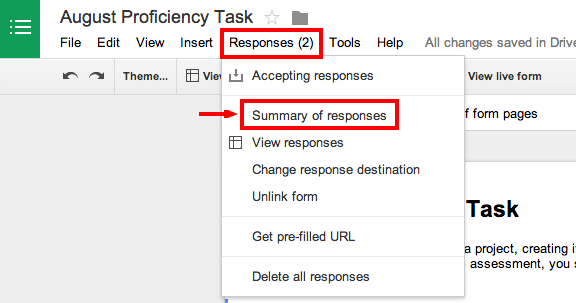 To get these charts, open the assessment form you created and click “Responses” then “Summary of Responses” as shown below. I can see that 86% of users correctly chose “False” in question #12 but with question #13, people didn’t seem as certain what the answer was. This might be something I want to address with the users in phase 4 of the Training and Implementation Plan. How about the time it took to complete the task and task difficulty? 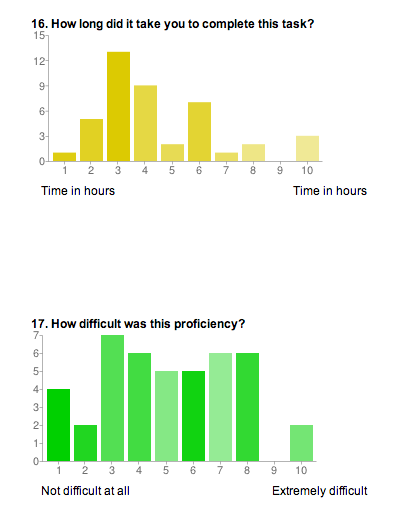 It appears the proficiency task took the majority of users between 3 and 4 hours but there were quite a few who took 6 hours to complete. Notice the bars on the far right? Looks like 2 people took 8 hours to complete while 3 took a whopping 10 hours to complete! I ought to dig into the data and reach out to these people to see why they struggled with the task and offer them some one-on-one training and assistance to get them up to the same level as other users. As you can see, this is powerful stuff! How many implementation projects can provide up-to-date training metrics like this? I would guess close to zero. After reviewing the data and charts, share it! Send it to the users, along with the correct answers. They will want to know how well they did on the assessment. Most importantly, share this information with the project team, steering committee, management and any other key stakeholders. Be transparent and honest. If users are doing well, great! If not, adjust the training and focus on the trouble spots. At least you know where to focus rather than guessing or taking the word of one or two individuals. User readiness was one of the many things that kept executive management up at night during my implementations. I was asked on more than one occasion how users were doing with the new system. I had real data to rely upon for my response and I knew the users were getting better because I was in constant contact with them. With monthly proficiency tasks, you too can confidently report on user performance to anyone in the organization. Phase 3 of the Training and Implementation Plan is Monthly Proficiency Tasks. Proficiency tasks are a means of measuring the proficiency of a user. Do they understand the “how” along with the “why” of this new software? In many cases, users are shown a new software system only once prior to go-live and it is so far away from the go-live date that they have completely forgotten everything that was shown to them. Other training programs keep users engaged by Computer Based Training (CBT) or other means but they don’t know how well this training is transferring knowledge to users. Incorporating monthly proficiency tasks as part of an overall training and implementation plan captures real data from users and assesses whether or not they are comprehending what is being taught to them from both a practical and theoretical perspective. It lessens the amount of training time required in Phase 4 and also allows an implementation team to focus on areas where users are struggling or highlight any system issues. Subscribe and stay tuned for the final phase of “Secrets to a Successful Software Implementation”! In the introduction to this post I mentioned the option of creating a Google Site that you can direct users to during the project. If you are managing multiple modules and want to keep the content in a central repository, then I recommend creating a site. Let’s go.